Enhance the beauty of your home's decor with any of the luxurious vinyl flooring options available from our locally owned flooring store. We offer new vinyl floors in a full palette of colors and attractive styles that are suitable for any room in your home. With vinyl's ability to evoke the appearance of other high-end flooring materials at a lower price point, it is truly one of the more versatile flooring materials on the market today. Its sturdiness, ease of maintenance, and beauty combined with its affordability make vinyl flooring a wise home-improvement investment that can last for decades. Whether you choose vinyl tile flooring, vinyl sheet flooring, or luxury vinyl plank, our products come from renowned manufacturers such as Armstrong™ and Downs™. Because vinyl floor materials carry a thin, supportive backing of foam or felt, they provide added warmth and cushioning for a slightly softer surface than natural tile, stone, or wood floors. Additionally, vinyl is among a handful of flooring types that can be installed without removing an existing floor and its outstanding water resistance allows for easy cleaning with an occasional sweep or mop. Add the timeless appeal of stone to your floors with one of our gorgeous vinyl tile flooring options. Also known as luxury vinyl tile (LVT), this innovative flooring option is available in a wide selection of sizes, colors, and textures that make it a perfect fit in any space. LVT is popular among homeowners for its good looks, ease of installation, and effortless maintenance. Additionally, vinyl tile is particularly favored for its ability to merge the comfort and longevity of traditional vinyl floors with the versatility and creative freedom associated with natural flooring such as limestone, granite, and travertine. For homes with young families and pets, durability is they key when considering new floors in high-traffic areas. Where the risks of potential scratching, gouging, or heavy wear exist, our vinyl sheet flooring makes for an appealing option. In addition to offering a high degree of durability, sheet vinyl is extremely simple to clean as it is seamless, waterproof, and safe for use with most cleaning solutions. This style of flooring's appeal isn't just the utilitarian aspect—the decorative possibilities of sheet vinyl are endless. 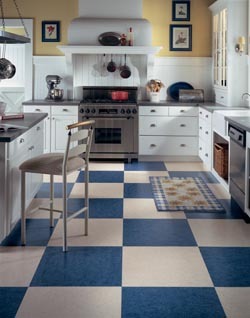 Vinyl sheet floors are available in a number of patterns, colors, and textures. Installation is a snap as well. Because your new floor arrives in an unbroken roll, it installs in a single piece with minimal cutting or assembly required. Bring the sophistication of natural flooring to areas where hardwood is impractical or impossible. Commonly referred to as luxury vinyl tile (LVT), vinyl plank flooring offers a creative solution to incorporate the aesthetic of wood flooring where moisture and traffic would warp or ruin it. With beautifully detailed surface ridges and knots, LVT faithfully recreates the appearance of a number of popular hardwoods. With the wide array of finishes available, vinyl plank floors look and feel just like wood at a price that is ideal for any budget. Once you've chosen the new vinyl flooring that is perfect for your home, protect your investment with guaranteed vinyl flooring installation. Each member of our locally operated staff is a certified flooring contractor with the experience and equipment to lay your new floor with a precise fit and finish. On each installation we perform, we offer a lifetime guarantee on our labor. If you experience any problems related to your flooring installation, our professionals will return to your home and make it right at our expense. Contact us today and allow our vinyl flooring experts to help you with all of your flooring needs. Our team proudly serves customers in Oklahoma City, Midwest City, Moore, Yukon, and Edmond, Oklahoma, as well as the surrounding areas.